Quids in! works closely with UC claimants and they tell us that moving over to the new benefit system is not always very easy. In fact, they say that the more you’re struggling with your money before you transfer to UC, the more likely it is that you’ll need help. Their feedback helped us put together a Guide to Universal Credit for new claimants. 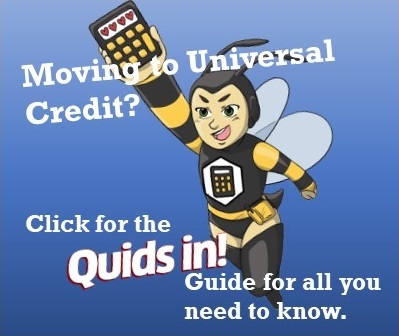 (It is available to buy in the Quids In Store or you can ask your local council or landlord, if you have one) The Guide talks you through what you need to know – what other claimants wish they’d known before. It starts with the three Bs: Banking, Budgeting and Being Online. Banking: You will need a bank account or similar that allows you to receive electronic benefit payments. Ideally, you will be able to make direct debit and standing order payments, which means your rent can be paid automatically without you worrying about it. If you have a bad credit history, most people can still get a Basic Bank Account but you need to know what you’re asking for. You also need ID, which you might need to make your UC claim too, so it’s worth getting this organised as early as possible. Read more. Budgeting: UC claimants receive any of all the six benefits listed above in one monthly payment and in arrears. This includes your rent money, if you previously claim Housing Benefit, and claimants say their biggest challenge is keeping this safe when there are so many things to pay out for. UC takes a while to set up and because it’s paid in arrears, there is a minimum 6-7 week wait for the first payment but many report waiting 3 months. To stay on top, it is best to plan a budget – all your money coming in and going out each month. You may find you need to cut back or, if there’s time, start saving to tide you over while awaiting the first payment. Saving regularly with a credit union (who may help you with a budget) could mean you could get a small loan to help you through the weeks without payment. Read more. Being Online: Now, if you’re here, you should be okay but spread the word because another shock for many was that to claim and manage UC, you have to be online. You will need an email address and know how to use it. You will need access to a PC, a tablet or a smartphone (although forms on these are fiddly) and you’ll need to know how to use these too. If you need help, find your local UK Online Centre, who will not only help you learn how to use a computer and the internet but can often help you organise your online Universal Credit account.